Lots of companies have make programs and webpages that appear as windows update or that your computer is infected, etc. I caught a new one trying to get into my computer today. The popup has the same style, colors and layout that real Flash updates have, black gray, red. VERY easy to just click without thinking about it, especially since Adobe does notify of updates fairly often. These folks are preying on your habit to CLICK without reading. This is SCUMWARE not FLASH update. Look closer please before you click! 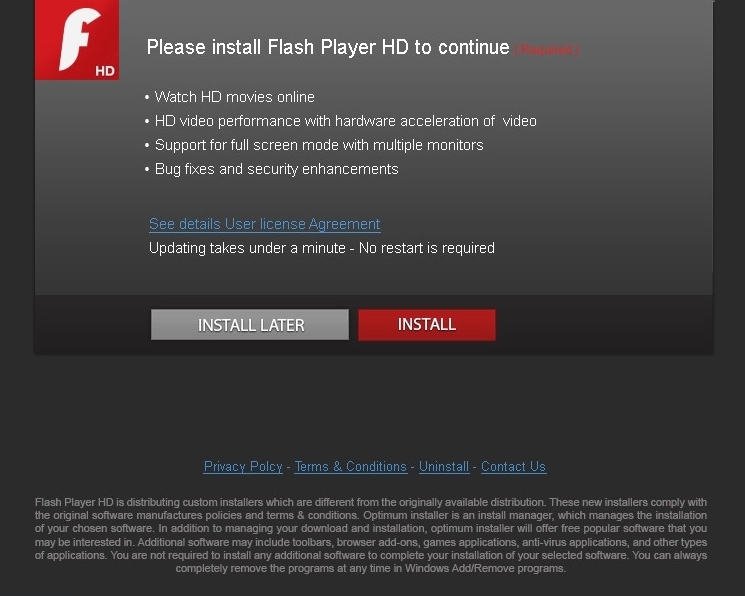 Flash Player HD is distributing custom installers which are different from the originally available distribution. These new installers comply with the original software manufactures policies and terms & conditions. Optimum installer is an install manager, which manages the installation of your chosen software. In addition to managing your download and installation, optimum installer will offer free popular software that you may be interested in. Additional software may include toolbars, browser add-ons, games applications, anti-virus applications, and other types of applications. You are not required to install any additional software to complete your installation of your selected software. You can always completely remove the programs at any time in Windows Add/Remove programs. It is clear you are giving permission to put lots of extra things on your computer that you are not approving individually. They are legally notifying that they are going to load trash. Taking a few seconds to READ the popup will save you a TON of grief. We all use FLASH. To stay safe, I strongly recommend that you go to http://get.adobe.com/flashplayer/ to download your updates instead of approving updates from popups. Thank you very much for bringing this Scumware to our attention. My main site has been attacked several times so I appreciate any news about these kinds of attacks. I ALMOST hit install out of habit. I always update my flash. But this time I was talking on the phone and I hesitated because I thought the icon wasn't quite right. If they had used the real flash icon, I might have just hit install then been in a world of hurt. Because of this new threat, I will not install flash updates from popups now. Only from the adobe page directly to be sure I am getting the REAL update. I was lucky this time. Wanted to save someone else grief too.